In anticipation of the 43rd edition of FIAC which will take place from October 20 through 23 (vernissage Wednesday, October 19), we have great pleasure in announcing the opening of the new sector of FIAC, On Site, which will present sculptures and installations in the prestigious context of the Petit Palais, directly opposite the Grand Palais, in collaboration with Christophe Leribault, curator and director of the Petit Palais, and associate curator Lorenzo Benedetti. Lorenzo Benedetti is an independant curator based in Paris. From 2014 to 2016 he was director and curator of the de Appel arts centre in Amsterdam. Between 2008 and 2014 he was director and curator of the art center De Vleeshal in Middelburg (Netherlands) and in 2013, curator of the Dutch Pavilion for the 55th Biennale of Venice. In 2005 he founded the Sound Art Museum in Rome, a space dedicated to sound in visual art. He has been the director of the art centre Volume! in Rome and a curator at the Museum Marta Herford, in Herford, Germany. Built for the Exposition Universelle of 1900 like its neighbour the Grand Palais, the Petit Palais became the Musée des Beaux-Arts de la Ville de Paris in 1902. Its collections illustrate the principal artistic currents from Ancient Greece until World War I, together with the decorative arts. On Site will present around 20 artworks, exhibited in the Galerie Sud, the Pavillon Sud and the Jardin du Petit Palais, as well as on the esplanade in front of the museum. This sector will enable FIAC galleries to exhibit important works in unique conditions within the remarkable context of the historic Petit Palais, in close proximity to their stands at the Grand Palais. So as to better visualize the exhibition spaces, we invite you to take our virtual tour of the venue. 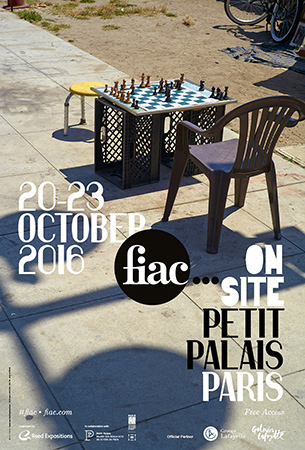 Application forms for the FIAC 2016 On Site sector are available for completion online on our website. The application deadline is set for Friday, July 1, 2016. Only galleries admitted to the General Sector or the Lafayette Sector of FIAC may be selected for On Site. Galleries may submit several projects, either alone or in collaboration with other galleries, whether or not they are exhibiting at FIAC 2016.